Details relating to the Greek Commemorative of 2013. This coin commemorates the 2,400th anniversary of the founding of the Platonic Academy. Only the Greeks are able to look back over 2,000 years and see cultural institutions of a standard that rivals all the world can currently present. Well done Greece! Plato, a pupil of Socrates, founded the academy around 387 B.C. Here he taught philosophy and the rudiments of science and encouraged his students to research and think, not to just accept. Western culture in the making. The motif is a portrait of Plato looking to the left. Around the edge of the inner circle, running from seven to one o’clock is the inscription : ” 2400 ΧΡΟΝΙΑ ΑΠΟ ΤΗΝ ΙΔΡΥΣΗ ΤΗΣ ΑΚΑΔΗΜΙΑΣ ΠΛΑΤΩΝΟΣ” (2400 years since the founding of the Platonic Academy). Under this inscription is the country designation ΕΛΛΗΝΙΚΗ ΔΗΜΟΚΡΑΤΙΑ. The mint mark and the year of issue are at three o’clock. 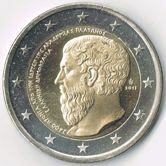 Return from Greek Commemorative 2013 to euro coin collector.